A happy new year to the several hundred residents who now read this blog – I am, as ever, humbled and thrilled by your continued interest in the local issues covered here. I’ll plough on in 2017 with regular updates on new development applications, local elections and other commentary, so if you’re on the email list, expect to get maybe three or four emails a month, probably no more. We’ve had a lot to be concerned about in local politics in the last 12 months. The local councils have struggled to cope with cutbacks, and the City Council has not had sufficient will or ability to fight the greed of those wishing to profit from every square metre of land available in the city. We can only hope that the current demolition of lovely million-pound homes in Queen Edith’s Way to make way for less pleasant houses is not the start of a trend. It could become one, and I don’t want to see us accept the views of the ideologues currently telling us that “more homes are all that matters”, or officials saying that nothing can be done. However, I think the City Council as a body has been doing a good job, and should be appreciated for that. Certain planning issues aside, the services which it runs, such as housing, rubbish collection and environmental health, seem to be performed well. We really should give them credit where it’s due. If only the County Council were half as good. The day when Cambridge gets to decide on its own education, transport and social services issues cannot come fast enough. People from over an hour’s drive away in places like Wisbech have their own problems to solve, and neither of us want – or need – each others’ representatives determining our own local concerns, especially when our politics are so different. Watch one of Antony Carpen’s videos of county council meetings and you’ll weep at how ineptly we organise ourselves as a society. The there’s the ‘City Deal’. This huge investment in the “Greater Cambridge” area’s transport, housing and training infrastructure has been overrun by myopic officers from the County Council who seem way out of their depth. It seems to have almost no progressive ideas, and just wants to fight those who offer any. The result has been protest marches and calls from both local MPs for the whole thing to be stopped. I can only see things getting worse in 2017 as there’s almost no way to change things democratically. One thing we will get to vote on, in May, is a Mayor for Cambridgeshire and Peterborough. This will inevitably be fought on political party grounds, to everyone’s loss, because it’s not about party issues. The Mayor has been described by our MP, Heidi Allen (who is applying for the role herself), as a “Minister For Cambridgeshire” and that makes sense. The job will involve transferring many housing, transport and other responsibilities from Whitehall to local control, and that will require someone who is conciliatory and can work with government. I’m hoping we can elect a mayor who will be recognisable and potentially popular, and who could help change our local politics away from the current ‘them-and-us’ situation where decisions appear to be made exclusively by old white men who almost nobody can name. If I wanted to set a question for the Monday night quiz at the Queen Edith pub which nobody could answer, I’d just ask: “Name the leader of the County Council”. Until you get to vote in the next election, resolve to see what else you can do in your local community in 2017. My own involvement with the Queen Edith’s Community Forum over the past two years has opened my eyes to how much great work is done by so many local people for their neighbours. It’s wonderful to see. On 9 February the organisation has organised a public presentation by Simon King, Project Manager from Cambridge University Health Partners, on the latest plans for the Biomedical Campus at Addenbrookes, possibly the biggest development project in the city in its history. This will be a brilliant opportunity to find out about what’s going on, and there’ll also be a chance to find out about the Queen Edith’s Community Forum too. I’d like to end by thanking those people who do represent us in government and our local authorities: it’s a largely thankless task, but it shouldn’t be. Tim Moore, George Pippas and Jennifer Page-Croft are our City Councillors. Amanda Taylor is our County Councillor. Heidi Allen is our MP. And Lewis Herbert, a Queen Edith’s resident, is leader of Cambridge City Council. Between them they represent three different political parties, which makes me optimistic about the future. They all have my best wishes for a happy new year. Yes, Cllr Tim Moore should obviously be thanked for representing ‘local interests’ given his supportive comments about the developer ( a local boy!) who is demolishing the two houses at the top of QEW. Cllr Moore also feverently supports the proposed destruction of our QEW verges and cherry trees. Cllr Taylor, too, was initially supportive of this County Council scheme. She though, unlike Cllr Moore, has listened to the sizeable body of evidence against . The County Council ( some Cllrs were honest enough to admit they had never even been down QEW!) say they ‘consulted widely’. Yes, they did. But dishonestly. The mock up pictures they asked us to vote on hid the fact that their proposals are, for much of QEW, for a 5m carriageway. So narrow that any two large vehicles ( two buses, say) who meet would have to move into the ‘safe’ cycle lane. 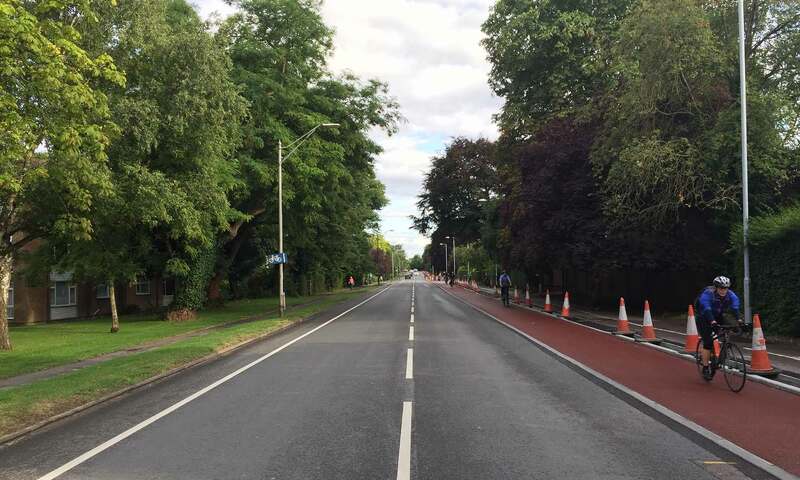 What was ‘dishonest’ about the 2015 consultation in principle about ‘whether cycle lanes were wanted, even if it meant some loss of trees and verges’, which came back with a large majority saying that they were. I don’t think that opinion has materially changed. We still need to design an ‘option 3’, that provides adequate segregated cycling space. If we don’t make our own suggestions first, we’ll be giving the initiative back to the council.